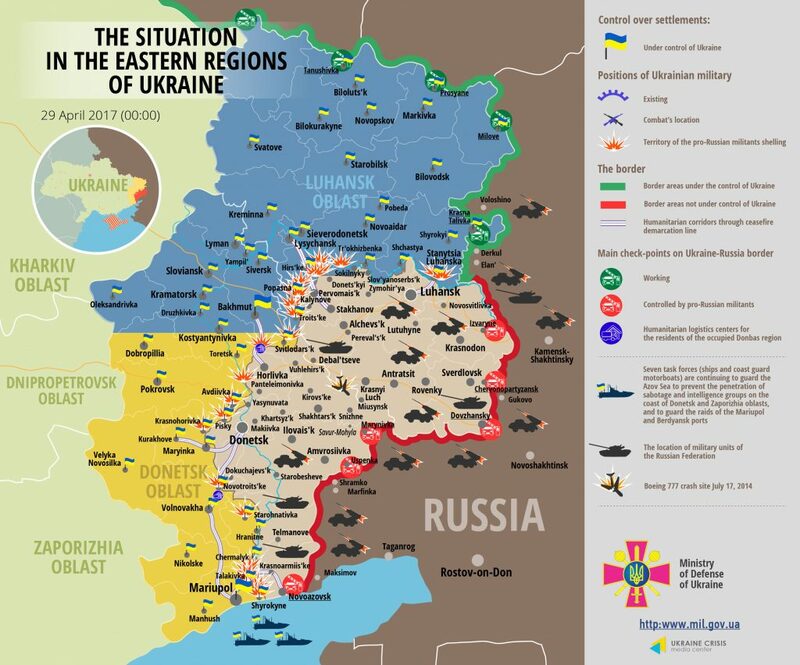 The situation in ATO zone in the east of Ukraine escalated yesterday in all sectors simultaneously. Militants resumed regular shooting attacks with heavy weapons 24/7, informed Ukrainian Ministry of Defense spokesman on ATO Colonel Andriy Lysenko at a press briefing at Ukraine Crisis Media Center. In Luhansk sector militants conducted 19 attacks, using heavy weapons nine times. The situation is the most difficult near Popasna. “Almost every Ukrainian frontline position came under hostile fire of mortars and 122-mm barrel artillery. Militants became more active after the sunset. The most intense attacks took place in Novozvanivka: militants fired about 50 mortar rounds at our positions in 35 minutes,” said Col. Lysenko. A series of mortar attacks took place in Nyzhnie – Novotoshkivske – Orikhove area adjacent to the Bakhmut road, during which militants fired over 20 rounds. In Novyi Aidar district Russian proxies delivered several attacks in the morning and in the afternoon. The situation was relatively calm in Stanytsia Luhanska area, and only in the evening militants twice attacked with light weapons in Stanytsia Luhanska and Valuiske. In Donetsk sector militants violated the ceasefire 16 times, using heavy weapons eight times. Russian proxies opened mortar fire at Luhanske just after midnight. The attack continued about one hour, they fired at least 25 mortar rounds. Militants used mortars and 122-mm cannons near Troitske in the evening. “Hostile attack lasted around 2.5 hours, militants fired at least 60 rounds. Moreover, militants were actively using other weapons, namely anti-aircraft mount, grenade launchers and small arms,” elaborated Col. Lysenko. Militants were repeatedly shelling Zaitseve during the day, and after 21:00 twice used mortars in Verkhniotoretske. Near Avdiivka Russia-backed militants conducted two mortar attacks during the day and one with light weapons in the evening. Each lasted about one hour. Moreover, militants used mortars and armor in Pisky after 18:00. In Mariupol sector militants conducted 35 attacks, including four with heavy weapons. They started an intense attack with heavy weapons at Krasnohorivka and the adjacent Ukrainian positions around 5:20, firing over 60 rounds in 30 minutes. In Volnovakha district two brief attacks with small arms were recorded in Novotroitske. Militants conducted multiple brief provocations with light weapons and armor in Pavlopil – Shyrokyne area. Three mortar attacks took place in Hnutove and Vodiane. “Hostilities continue 24/7 almost near each Ukrainian frontline position,” said Col. Lysenko. Two Ukrainian servicemen were in action yesterday, and six were wounded. “In Krasnohorivka one serviceman was killed and four were wounded. One casualty is in critical condition. One more soldier was killed near Pavlopil as a result of a vehicle hitting an explosive device. Two servicemen were wounded in hostile attacks in Zaitseve and Verkhniotoretske,” elaborated the spokesman. In Maryinka district two men were trying to saw a 30-mm projectile, which resulted in one of them killed and another wounded. “We yet again call upon inhabitants of frontline areas to follow the rules of handling explosive hazards and inform law enforcement agencies or military about the found items of ordnance,” emphasized Col. Lysenko.